Google’s Project Glass has the potential to bring something completely new to consumers – wearable computing devices that could revolutionize how consumers interact with the Web. The augmented reality glasses aren’t yet available to consumers, and are a work in progress. Google is holding its first developer workshops this week, offering developers the chance to use the devices for the first time, so that they can start coming up with applications for use on the devices. Project Glass are heavily visually oriented and many of the demonstrations of the devices show off the ability for wearers to take both photographs and video while wearing the glasses. Chances are good that we see the different visual queries that Google Goggles offer, including object and facial recognition, barcode search, searches for landmarks and books and other types of things as well. Google Glass also has the potential to work with local/mobile/social technology that Google has acquired through an assignment of 7 patents from deCarta, and alert type virtual post-it notes patented technology from Xybernaut Corporation. You’ll be able to find friends with Google Latitude as well. We’re also seeing technology developed for Android devices like Google Now and Google Field Trip that are likely to evolve and work well with something like Google Glass. June 1, 2012 – Future SEO and Paid Ads with Google Glasses? Google’s published a good number of additional patent filings, including both granted and pending applications, and some followup continuation patents that update some of the original patents. 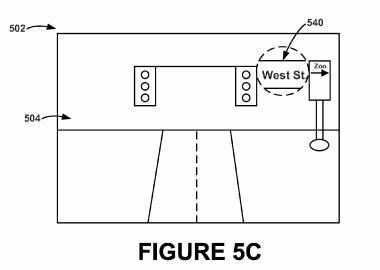 Given the Google Glass Foundry being held this week in both New York City, and San Francisco, I though it made sense to share a number of the other patent filings that have been published on Google Glass. I’m going to share these over a number of posts as we get closer to the date that developers will get a chance to start working with the devices. Here’s the first batch. Many of the recent Google Glass patents give us insight into the hardware behind the Glasses. 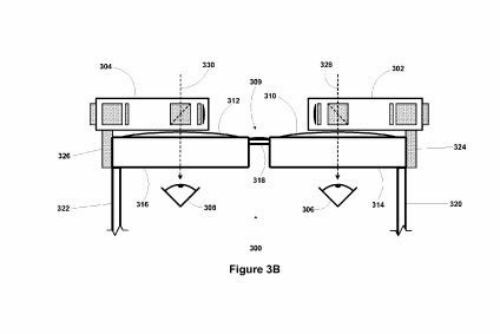 This first one, which was published on January 24th, 2013, describes two alternative optical systems that might be used to control the display of images on the glasses. 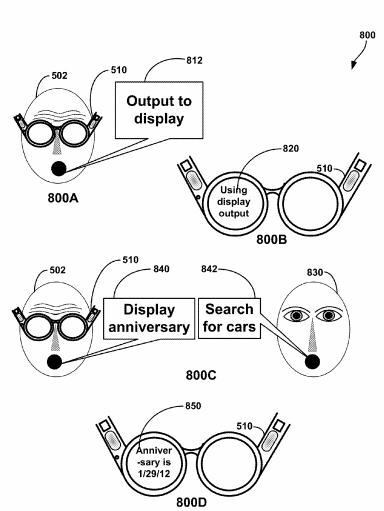 The glasses shown in the patent actually have display devices for both the left and right eyes. The demo versions of glasses have only had a display device on onete.de. An optical system includes a display panel, an image former, a viewing window, a proximal beam splitter, and a distal beam splitter. The display panel is configured to generate a light pattern. The image former is configured to form a virtual image from the light pattern generated by the display panel. The viewing window is configured to allow outside light in from outside of the optical system. The virtual image and the outside light are viewable along a viewing axis extending through the proximal beam splitter. 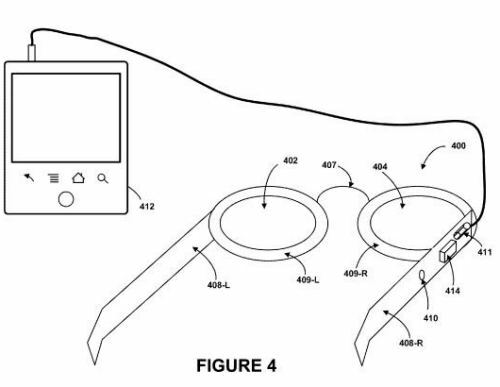 Exemplary wearable computing systems may include a head-mounted display that is configured to provide indirect bone-conduction audio. For example, an exemplary head-mounted display may include at least one vibration transducer that is configured to vibrate at least a portion of the head-mounted display based on the audio signal. The vibration transducer is configured such that when the head-mounted display is worn, the vibration transducer vibrates the head-mounted display without directly vibrating a wearer. However, the head-mounted display structure vibrationally couples to a bone structure of the wearer, such that vibrations from the vibration transducer may be indirectly transferred to the wearer’s bone structure. Imagine that you’re trying to read a street sign, but it’s just a little too far away. You make a gesture in front of your glasses, and they zoom in on a sign you’re trying to read. Example methods and systems for manipulating and displaying a real-time image and/or photograph on a wearable computing system are disclosed. A wearable computing system may provide a view of a real-world environment of the wearable computing system. The wearable computing system may image at least a portion of the view of the real-world environment in real-time to obtain a real-time image. The wearable computing system may receive at least one input command that is associated with a desired manipulation of the real-time image. The at least one input command may be a hand gesture. Then, based on the at least one received input command, the wearable computing system may manipulate the real-time image in accordance with the desired manipulation. After manipulating the real-time image, the wearable computing system may display the manipulated real-time image in a display of the wearable computing system. (iv) defining an active input region on the user-interface based on at least the determined active-input-region setting, wherein the active input region is a portion of the input region. One approach to controlling what Google Glass will do is through verbal commands that could request information to be displayed, or schedule some event, or delete information or control some other action, including running queries on a search engine. Of course, one of the concerns about speech input for glasses is when someone not wearing Google Glass tries to perform commands or queries. As shown in the image below, their “utterances” can be ignored by the device. Methods and apparatus related to processing speech input at a wearable computing device are disclosed. Speech input can be received at the wearable computing device. Speech-related text corresponding to the speech input can be generated. A context can be determined based on database(s) and/or a history of accessed documents. An action can be determined based on an evaluation of at least a portion of the speech-related text and the context. 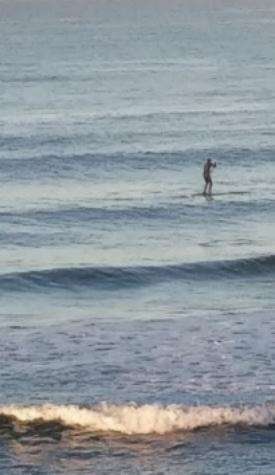 The action can be a command or a search request. If the action is a command, then the wearable computing device can generate output for the command. If the action is a search request, then the wearable computing device can: communicate the search request to a search engine, receive search results from the search engine, and generate output based on the search results. The output can be provided using output component(s) of the wearable computing device. I’ll have some more of the Project Glass patent filings over the course of the week, including one from Google’s Hartmut Neven, who came to Google when they acquired his company Neven Vision, and is the engineering manager for Google Goggles. 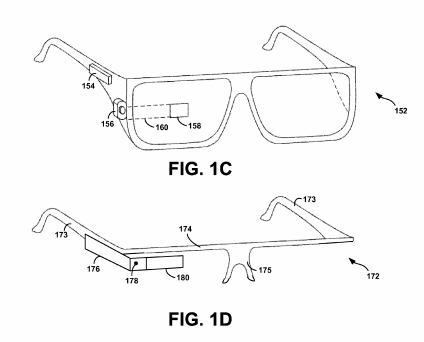 More Project Glass Patents, Part 2 covers 6 more patent filings from Google on Google Glasses. It is a technological leap but I do wonder what 2nd and 3rd gen glasses will be like. No doubt it will involve Google collecting yet even more data so they can know even more about our lives. …sounds great but what if you have no ears? On a serious note though, sure the technology is breakthrough but i’d like to see the hardware presented in a different way then stuck on a pair of glasses. Glasses first appeared way back in 1286 and the concept hasn’t really changed since then. I refuse to sit bespectacled and watch 3d television and I certainly won’t be a goggle wearing goon for google. First of all thanks a lot for bringing out all the information in such an organized manner. Naive like me can understand what are you talking about. I have been reading your blog for quite sometime and I must say you are really really strong on technology and its application. Google rolled out many products in the past as well and many of them failed.. What is your call about this product to be a successful one?